RUN YOUR FIRST EVENT TODAY! In order to sustain and grow the program, the REC Foundation is always interested in developing relationships with new Event Partners (EPs). Becoming an EP is a great opportunity for individuals who share our passion for robotics and seek to establish a revenue stream to sustain and grow their own robotics program. As a first step, speak to your local Regional Support Manager to share your interest and learn more about the opportunities. Please visit the REC Foundation’s Event Partner store to purchase referee shirts, fundraiser t-shirts, and volunteer shirts with the official logos. Online Resources: Contact your REC Foundation Regional Support Manager with your user ID for EP Access to each of the following! EP Supplies & Game/Field Components: Navigate to RobotEvents.com, login to your account, click “Administration,” and then go to the “Products” tab. Please remember, to receive your Event Partner discounts, your event must be posted and approved by your Regional Support Manager. 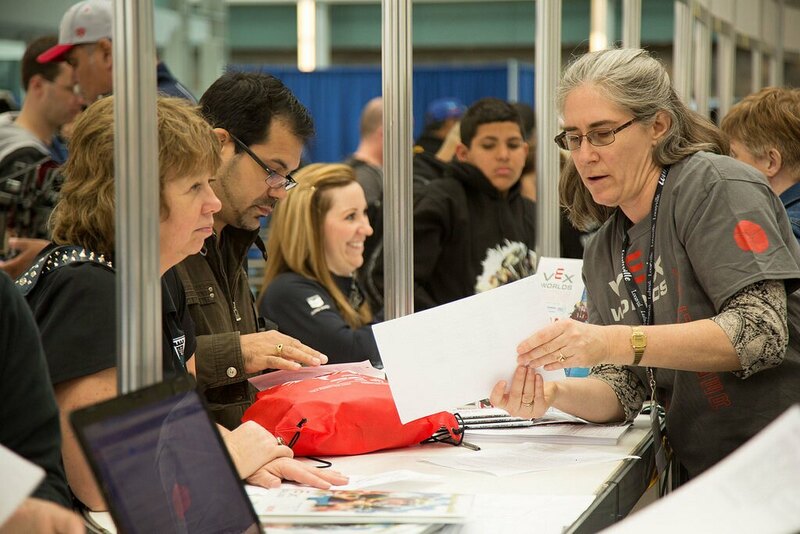 All VEX IQ Challenge, VEX Robotics Competition, and VEX U teams must register as an official team and register for any events at RobotEvents.com. Therefore, Event Partners must post their events at RobotEvents.com and there is no charge to use the site. EPs incur the cost of hosting their events and many of them ask teams for a registration fee to cover these costs. EPs may set a fee for their event when creating it in RobotEvents.com. RobotEvents.com now includes a flat $5 fee per registration for events this year. This new fee structure will still not cover all the costs of site maintenance, enhancements, processing, and accounting, but it will enable the REC Foundation to continue to make enhancements to the RobotEvents.com website and provide a better experience for all our teams and partners using the site. This fee will also include/cover/replace the 3% transaction fee that was previously taken out of team payments (it will not be in addition to that charge). Event Partners are encouraged to build this cost into their event fees for the coming season. The REC Foundation continues to lead the industry as the most affordable program of its kind and with record growth, improvements must be made to ensure our program succeeds for years to come. It is up to the Event Partner to determine what they need to charge to cover their local costs, but most one-day event fees range from $50-$100 per team and nearly all are less than $150 per team. Multi-day events and special locations may charge more. Most leagues charge as though a team is playing in a tournament. Contact your Regional Support Manager for more detail, especially if you are outside the USA. The enhanced RobotEvents.com experience will provide teams and Event Partners with a better user-interface and broader functionality throughout, providing an infrastructure that can grow seamlessly with the VEX IQ Challenge, VEX Robotics Competition, and VEX U programs. The following resources have been created to help familiarize users with the new version of the website. RobotEvents.com General Information – An overview of the new version of RobotEvents.com for new and existing users. Scheduling a VEX IQ Challenge or VEX Robotics Competition Event in RobotEvents.com – How to post an event in the new version of RobotEvents.com. Registering a Team in RobotEvents.com – How to register new and existing teams in the new version of RobotEvents.com.